Atheists Start PAC To Elect Nonreligious Candidates : It's All Politics Secular activists who count themselves among the "nones" — as in atheists, agnostics or those of no definite religious affiliation — say they hope a new political action committee will stiffen the backbones of lawmakers who may be too afraid to openly state their doubts about the existence of a divine author of the universe. Bishop McNeil, who isn't a cleric despite his name, speaks to reporters Wednesday at a news conference to introduce the Freethought Equality Fund PAC. Americans who count themselves among the "nones" — as in atheists, agnostics or those of no definite religious affiliation — have launched a new political action committee. The goal? To support the election of like-minded lawmakers or, at a minimum, candidates committed to upholding the constitutional separation between church and state. 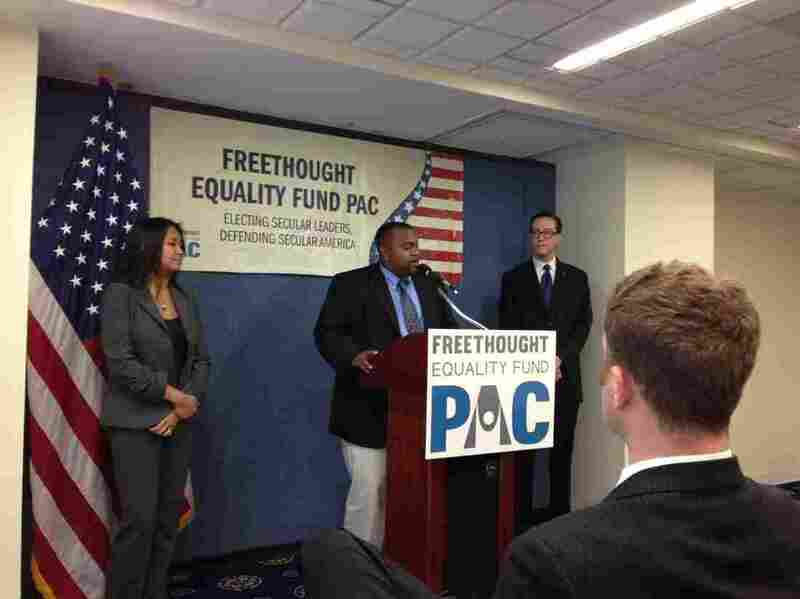 "The Freethought Equality Fund will work to elect the nones ... in addition to those who will work for our rights so we can finally have the representation in Congress we deserve," said Maggie Ardiente of the American Humanist Association, at a Washington news conference Wednesday where the new PAC was rolled out. Besides giving the growing percentage of Americans who identify as "nones" an opportunity to elect more candidates who share their values, the new political action committee's creators hope it will help stiffen the backbones of lawmakers who they believe are too afraid to openly state their skepticism and doubts about the existence of a divine author of the universe. "We already know of more than two dozen closeted atheists serving in Congress today," Ardiente said. "The fact that they're in the closet about their nonbelief says a lot about why this PAC is greatly needed. The time to come out is now and the Freethought Equality Fund will help make it happen." Humanists believe cultural trends are ever more favoring them. The percentage of Americans identifying as nonreligious has grown to about 20 percent of the population. Of course, the flip side is that the vast majority of Americans still subscribe to religion. Despite setbacks, like the ban on prayer in public school classrooms or the Kitzmiller v. Dover decision in which a federal court determined that intelligent design could not be taught as science to public school students, those who like their government with a lot of religion have had many victories. Among them: getting "In God We Trust" added to U.S. currency and the wall of the House chamber, and "under God" attached to the Pledge of Allegiance. The uphill slog to elect a more secular Congress has to start somewhere, so the new PAC's creators have chosen to begin by supporting five congressional candidates. The group includes two sitting House members: Reps. Bobby Scott of Virginia and Rush Holt of New Jersey, both Democrats. While their first endorsement list has a decidedly Democratic Party tilt, the PAC's organizers hope to support Republicans, too. "We're actively looking for all candidates regardless of their affiliation who will protect the separation of church and state and defend civil liberties," said the ironically named Bishop McNeil, the Freethought Equality Fund PAC's coordinator. "[But] based on our 2013 scorecard that we just completed, there are currently no Republicans in the House that would fit that."